On the nose I found strawberry, cherry, black cherry, a hint of cedar, raspberry, and black cherry candy like the blowpops they used to make, though I’m not sure they have that flavor any longer….I haven’t had one in years. In the mouth, the cedar on the nose seemed to follow through with spice, pepper, raspberry, currants, black cherry, cherry, and other red fruit. The wine showed as crisp with nice structure, and served the warm evening well. We had bratwurst for dinner last night and I thought sausage=fairly light red wine. 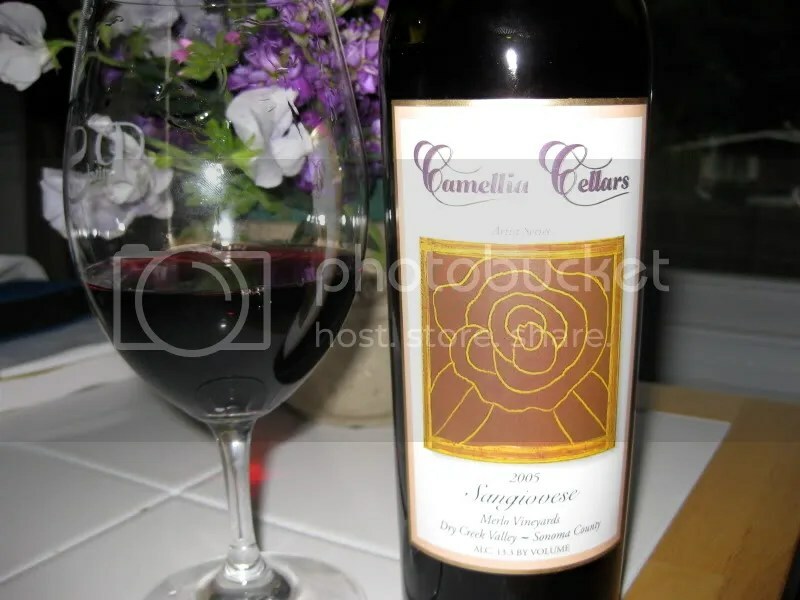 So I pulled a bottle of the 2005 Camellia Cellars Sangiovese from the basement. I probably should have had a beer…it seems like a more natural match with bratwurst, but a you know by now, wine is my thing, so wine it was. 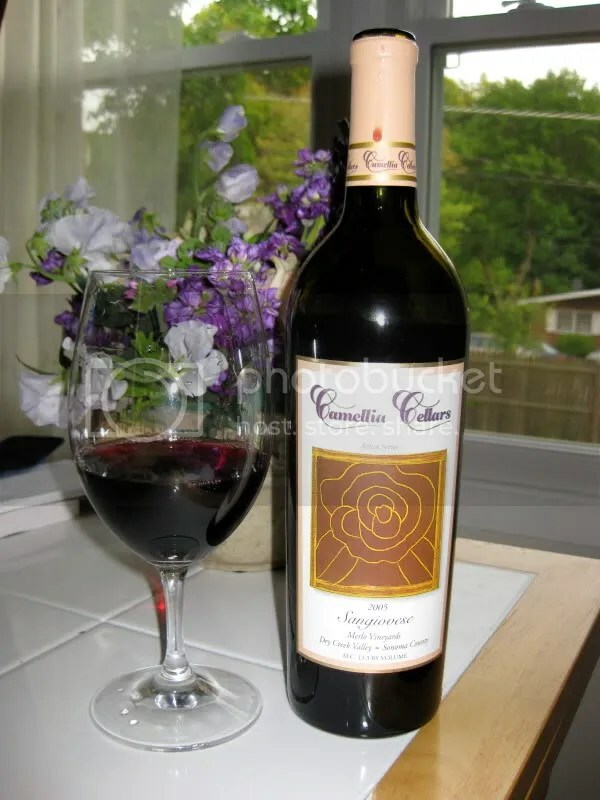 I purchased the wine at Camellia Cellars on one of last year’s CA trips but I can’t remember what I paid, it had a real cork closure, and clocked in at 13.3% alcohol by volume. On the nose I found strawberries, red cherries, raspberries, spice, milk chocolate, pencil lead, and flowers. In the mouth I got bright red fruit, strawberries, red cherries, spice, and red berries. Overall, I found the wine to be bright and juicy with great acidity. I think this would make an excellent pizza wine and I will be serving my second bottle with one of my homemade pizzas. And boy does it taste good! 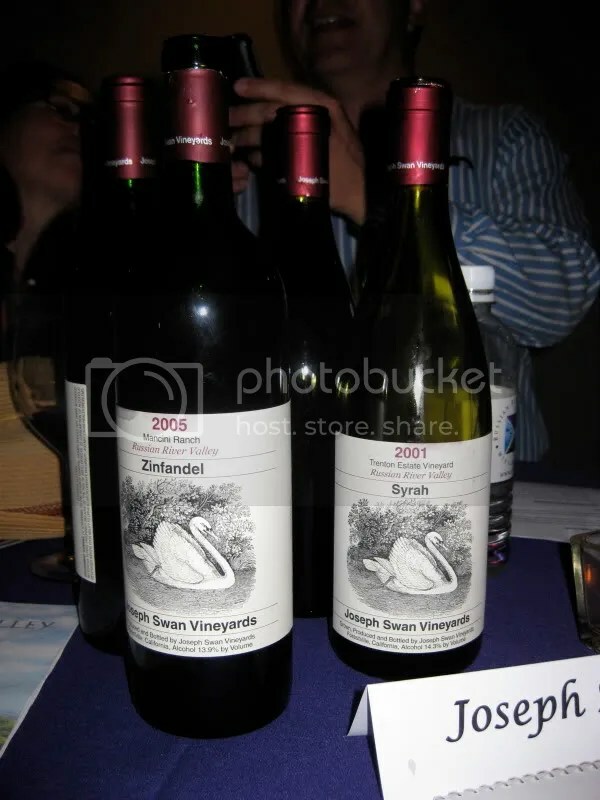 I purchased this bottle of 2001 Deerfield Ranch Sangiovese from WineQ in one of my recent club shipments. 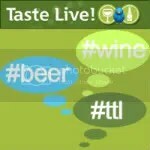 It costs $21.99 through WineQ (free shipping if you spend $35! ), had a real cork closure, and clocks in at 13.6% alcohol by volume. It hails from the Clear Lake area, specifically from the Roumiguiere Vineyard. The winery made 645 cases of this bottling and it has swept up a ton of awards! Cherry, strawberry, flowers, leather, spice, and earth jumped out of the glass. The wine was very fruit forward and the nose was definitely dominated by the cherry and strawberry. In the mouth the wine was also full of fruit. The cherry was the prominent flavor, with roses and strawberry also showing up. The wine had just a little tannin, it’s drinking perfectly right now and was incredibly smooth after very little time in the glass. 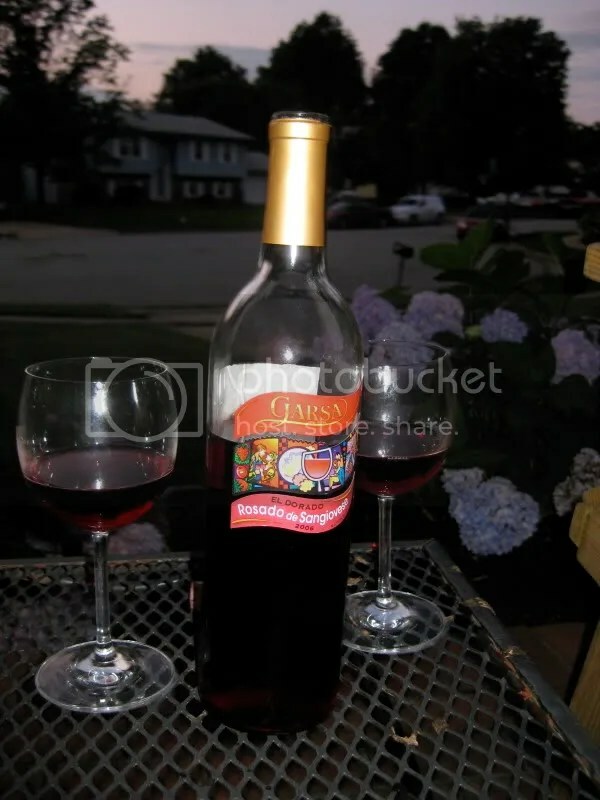 I really enjoyed this bottle of wine, and were it not for the fact that I can only get a few more WineQ shipments before it gets too hot here and there are lots of other WineQ wines I want to try, I would certainly be adding more of this to my Q! With Matt’s Uncle Bruce in town, we found ourselves out and about again this week. The museum he is involved with here was having an opening event and Bruce invited us along. At the event, which was very well done, a Renwood Sauvignon Blanc was served, a nice surprise and departure from the flabby Pinot Grigio or oaky Chardonnay you usually find. After the event, we headed out to one of our favorite local Italian places, the Odeon Cafe in Dupont. To our surprise, we had to wait for a table, I guess it’s getting more popular as we used to just waltz in and sit right down. We waited at the bar and ordered a bottle of 2004 E All Omo Il Vino Toscano Sangiovese. As for the wine, on the nose I found oak, black cherries, dark fruit, spice, earthiness and leather. In the mouth I would describe the wine as dense and dark, with spice and dark fruits, blackberries, cherries and currants. The tannins were big and I think the wine could definitely age for quite a while. 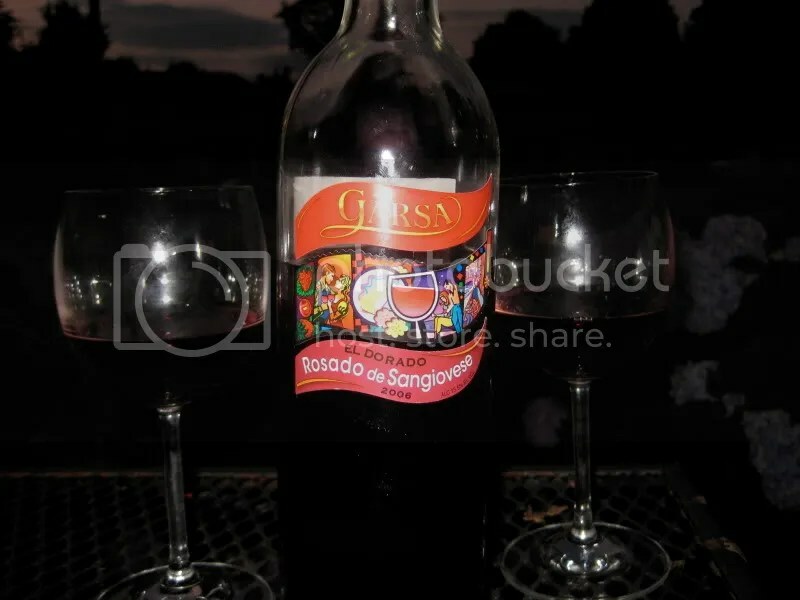 Everyone had something different for dinner, but I do sometimes like to pair an Italian wine with Italian food. Matt had lobster ravioli with a tomato cream sauce, Bruce had gnocchi with cream sauce and bacon and I had the 4 cheese fettucini. The wine was actually a nice complement to the cream sauce and I thought the pair was pretty good. We’ll be back to the Odeon Cafe again as the food is always reliably good and the prices are decent. The wine list needs some help though. It’s not very long or diverse and the prices are mostly in the upper $40s and above! 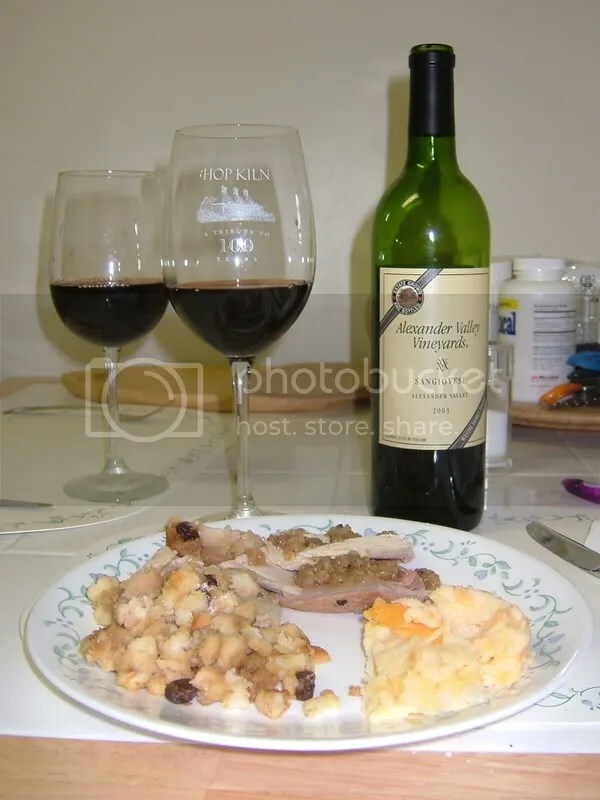 Leftover turkey and sides, which gives me another chance to try pairing wine with the turkey. And yet again, I’m led to the conclusion that there’s just no great wine that will pair well with it all. Oh well, it gives me yet another excuse to try more wines! Sunday night’s was a 2003 Alexander Valley Vineyards Sangiovese. We picked this bottle up at Alexander Valley Vineyards this summer for $20. We had a great time at the vineyard. We were the only people there and our server was great. He spent a lot of time chatting with us and even gave us a nifty corkscrew when he found out we were on our honeymoon. Came in handy when we got to LA and really needed a bottle of wine! Back to the wine. It had a lot of strawberry jam on the nose and more strawberries in the taste. Very full in the mouth. A bit unfinished at the end. It will definetly improve with age. I’d keep it around for a few more years to let it round out. The finish smoothed as it aired out and I was reminded once again that I really need to make more use of the decanters we got as wedding presents.